The Dutch team at the 1934 World Cup, San Siro stadium, Italy. The World Cup is an event that excites the footballing world. The English press heightens the expectations of a nation, only for our beloved team to falter and fall. Whether penalties, Germany, or the weather, the expectations of a nation are never, in reality, within England’s grasp. Brazil, the most successful nation, have retained the Jules Rimet Trophy since 1970 for winning the competition three times. They have since won the replacement World Cup trophy a further two times. Why can’t England play like Brazil; why does England always expect; and why is the World Cup more than just a football match? In 1929 the Uruguayan Football Association asked the English Football League to send a team for a tournament during the summer of 1930. This tournament was to celebrate the centenary of Uruguay’s independence. This coincided with FIFA president Jules Rimet’s plan to stage a FIFA-organised World Cup in recognition of the success of football at the Olympic Games. The Football League sent their apologies; they would not be sending a team to the tournament, now recognised as the first official World Cup Final. In 1933, the Lieutenant Governor of Malta sent a letter to the Foreign Office reminding them of the importance of ‘national prestige’, when the national team plays abroad (FO 395/492 folio 202). In 1934, although England was not part of FIFA, they were invited to play in the World Cup, held in Italy. England again declined. Italy beat Czechoslovakia in the World Cup final, and arrived to play England at Highbury that November. The English press dubbed the game the ‘real’ World Cup final. The Foreign Office had accepted tickets to the game (file 234/378: FO 372/3036), but were unable to attend the fixture ( FO 371/18420 file 6262). England won the ill tempered game 3-2. The following day The Guardian ran the story ‘the Battle of Highbury’ and called for England never to play international friendlies again. 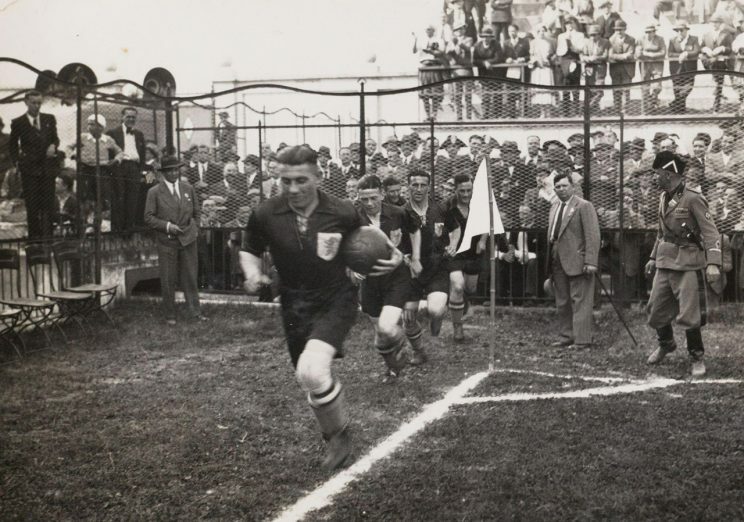 In the build up to the 1938 finals held in France, the Foreign Office again had their views. The conduct (P2241/28/150) and performance (P1718/P2054/28/150) of the team were raised. They also gave their views on the strength of the Portuguese team (P673/28/150). FO 395/568 includes the Foreign Office’s suggestion that the Football Association only send its strongest teams abroad. Throughout the 1930s the Foreign Office report on the bad behaviour of teams on tour. They also regularly remind the Football Association on the conduct of teams abroad, even refusing permission for teams to go on tour. West Ham were denied permission after requesting a trip to play Barcelona during the Spanish Civil War. All these files could suggest the reason why England did not attend any tournament prior to 1950. It was not down to travel, distance or even the opposition. It was how England would be perceived if they lost. England did not want to fail at anything. Civil War in Spain, the financial crisis around the world, and the rise of a new power in Germany, meant England wanted to look and remain strong. Losing a football match to anyone was not on the agenda. In 1929 the Daily Express quoted the Foreign Office: ‘Play our first class teams on the continent. It regards it as essential that British prowess shall be well maintained’. This article, by Keith Mitchell, has been adapted from the National Archives blog, and is reproduced under the terms of the Open Government License. References refer to National Archives documents unless stated.